One of the most popular and easier treks, offering great views of the highlands, landscape and the beautiful lakes and Phajoding monastery. Glimpses of the Himalayan Kingdom’s most revered sites, such as Paro Taktshang (Tiger’s Lair), the current and the ancient capitals of Bhutan, Thimphu and Punakha respectively, the World’s largest Buddha statue amongst others. After lunch at the hotel, begin Paro sightseeing by driving to the National Museum (once a watch tower – Ta Dzong), which has some of the Kingdom’s fascinating collection of art, artifacts, thangkha paintings and Bhutan’s exquisite postage stamps. Then, drive to the massive Rinpung Dzong (Castle on a Heap of Precious Jewels), another historic Bhutanese structure. Later, take a stroll of Paro town. After breakfast and a 30 minute drive, you begin one of the most exciting sections of your trip, the hike to Taktsang Monastery, The Tiger’s Lair. One of the most revered religious sites in Bhutan and a centre for pilgrimages, the monastery is perched some 1000meters on a cliff, overlooking a valley. Associated with the great Tantric Saint from the 8th century, Guru Padma Sambhava, it is believed that Padmasambhava came riding on a tigress in a fiery and wrathful form and in a cave within the temple subdued the evils who were obstructing the spread of Buddhism. Since then, several Buddhist masters have meditated in and around the monastery. Some have even discovered hidden religious relics. The hike takes about five hours (round trip) and follows an ancient path marked by river powered prayer wheels. 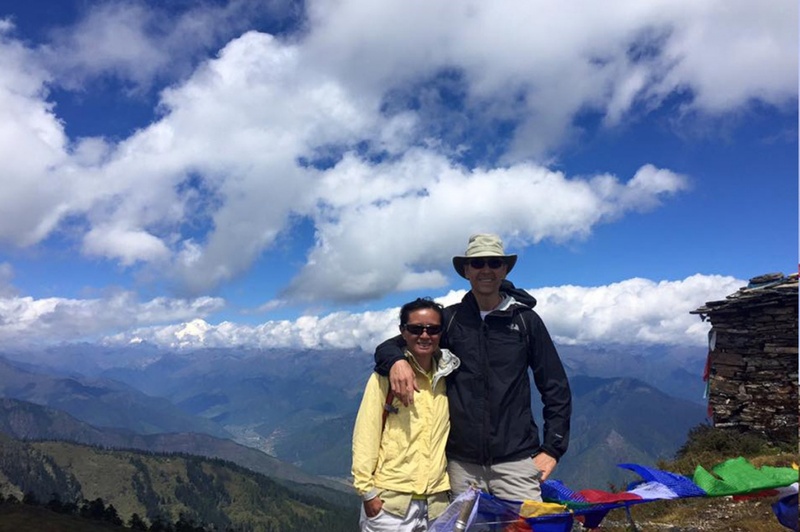 Day 03: Paro – Jili Dzong(Distance 5 km, 1,090m ascent, camp altitude 3,480m). – Jangchulakha (Distance 10 km, 3hours, 310m ascent, 50m descent, camp altitude 3,770m). Your trek begins after a 45 minutes drive. The first day is long and arduous as you have to scale elevations more than 1,000m. It starts with an up-hill climb to a steep ridge, after which the trail leads you through blue pine and fir forests to Damche Gom. Upon arrival at the ridge near Jili Dzong, you will have your lunch. After lunch begins the trek to Jangchulakha(Distance-10 km, four hours, 310m ascent, 50m descent, camp altitude 3,770m). It involves an up-hill climb for about an hour and a half, that continues to ascend. You will be taken through thick alpine forest and dwarf rhododendron tress. You may see yaks and yak herders around your campsite. Day 04: Jangchulakha – Jimilang Tsho (Distance 11 km, four hours, 230m descent, 330m ascent, camp altitude – 3,870m). It is a trek that follows the ridge and which, on a clear day offers you an enchanting view of the mountains and valley. You will camp close to Jimilang Tsho (Lake), known for its giant sized trout. Day 05: Jimilang Tsho – Simkotra Tsho (Distance 11 km, four hours, 820m ascent, 400 m descent, camp altitude 4,110m). Day 06: Simkotra Tsho – Phajoding (Distance 10 km, three to four hours, 130m ascent, 680m descent, camp altitude 3,750m). Day 07: Phajoding – Mothitang (Distance four to five km, three hours, 1,130 m descent). It is a gradual descent through forest carpeted by blue pine all the way to Motithang (Thimphu). Overnight at a hotel in Thimphu. You will discover the beauty of Thimphu and its treasures epitomized in the historic and massive structures such as the largest Buddha Statue at Buddha point, the 12th century Changangkha monastery, Takin zoo, Sangaygang (view point of Thimphu valley,) Handicrafts Emporium, Nunnery and the Memorial Chorten (Stupa). After lunch, you will visit the Tashichho Dzong (Fortress), the main secretariat building. This massive structure houses the King’s office, Throne Room, some government Ministries, the State Monastic Body and the living quarters of the Chief Abbot and senior monks. We will visit the archery ground and witness a match, if there is one ongoing. In the evening, you can stroll around the Capital’s market. The drive till Punakha will take about three to four hours and traverses through beautiful forests composed of rhododendron and fields of dwarf bamboo. The landscape, green meadows, beautiful wildflowers, gushing waterfalls and constantly changing vegetation offers breathtaking scenery. About 45 minutes drive from Thimphu, is the Dochula pass (3,100m). From here one will get their first glimpse of the eastern Himalayan ranges, consisting of snow-capped peaks with heights measuring anywhere from 6,000m to 7,554 m. The pass is also exotic in flora and fauna. Apart from this, the spectacular 108 stupas or chortens build around a mound at the pass makes the place a visitor’s delight. The road from the pass descends all the way to Punakha. Before reaching Punakha, you will visit the Temple of Fertility (Chimi Lhakhang), which is an hour hike (round trip) from the road. Associated with Lam Drukpa Kuenley (Divine Madmonk), this 15th century structure is a place where the phallus is worshipped, with barren women from around the world receiving blessings from a phallus. You will then arrive at Punakha Dzong (Fortress), which from far looks like a gigantic ship perched on a mass of water. Punakha served as the capital of Bhutan until 1955 and is home of the Chief Abbot and the central monk body during the winter months. Built in 1637 by Shabdrung Ngawang Namgyal at the confluence of two rivers (Pho-male and Mo-female), the Fortress is the quintessence of Bhutanese architecture and was a hub of ancient Bhutan’s civil and religious life. It houses some of the Kingdom’s most sacred relics in the form of religious antiques. In the morning, we will visit ruins of Wanduephodrang Dzong (Fortress), which was built in 1638 by the Shabdrung and tragically gutted by a fire in 2012. We will also take a stroll of Wangdue town.